Divide Rice Chex™ cereal evenly into two large bowls. In a large microwave-safe bowl, melt dark chocolate on high at 30 second intervals, stirring after each, until melted and smooth. Stir in 3-4 drops peppermint extract. Pour chocolate over one bowl of Chex™ cereal and stir gently to coat completely. In a small bowl, combine 1/2 cup powdered sugar and cocoa powder then stir it into the chocolate-coated cereal mixture, coating completely. Spread cereal mixture onto wax paper to set. In another medium microwave-safe bowl, place white chocolate and green candy melts. Microwave on high at 30 second intervals, stirring after each, until melted and smooth. Stir in 3-4 drops peppermint flavoring oil. Pour white chocolate over second bowl of Chex™ cereal and stir gently to coat. Sprinkle mixture with 1/2 cup powdered sugar and stir gently to coat completely. Pour onto wax paper to set. When both cereal mixtures are set, combine in a large serving bowl and sprinkle 1 cup mint baking chips (optional) on top. Store in an airtight container at room temperature. Suffering from Thin Mint cookie withdrawl? Get that loving feeling back with this Chex Mix recipe! I have terrible news that you may or may not be aware of: Girl Scout Cookie season is officially over for this year. I checked on my Girl Scout Cookie Finder app (yes, they have one! ), and those sweet little girls are baking up a storm for next year. While my waistline is grateful, we are craving the awesome flavors of those tasty cookies! And, unless you have a giant freezer full of a secret cookie stash, I’m guessing you’re starting to miss those delicious flavors as much as I am. So, for your enjoyment, we’ve created this delicious Thin Mint Flavored Chex Mix recipe inspired by our our favorite Thin Mint cookie flavor. First divide the Chex cereal into two bowls. 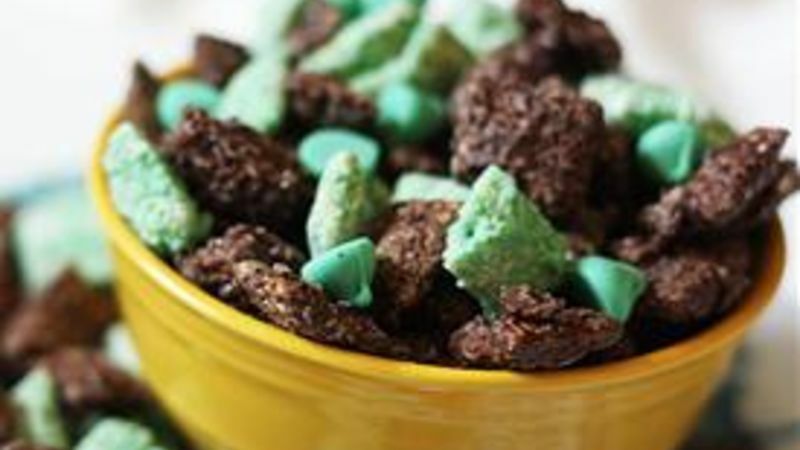 In the first bowl, you'll mix up the mint-flavored dark chocolate Chex Mix. In the second bowl, you'll make the pretty minty green Chex Mix. Now it's time to let these two meet. Get a big bowl and mix 'em all up. Garnish your combo with a few mint baking chips, and you’ve got a super easy Chex Mix winner! I bagged up these sweet treats with some cute labels and sent them to friends who were suffering from cookie depravation. It was a huge hit! Enjoy!